On Saturday, September 17th, the Russian space agency (Roscosmos) stated that it would be delaying the launch of the crewed spacecraft Soyuz MS-02. The rocket was scheduled to launch on Friday, September 23rd, and would be carrying a crew of three astronauts – two Russia and one American – to the ISS. After testing revealed technical flaws in the mission (which were apparently due to a short circuit), Rocosmos decided to postpone the launch indefinitely. But after after days of looking over the glitch, the Russians space agency has announced that it is prepared for a renewed launch on Nov. 1st. 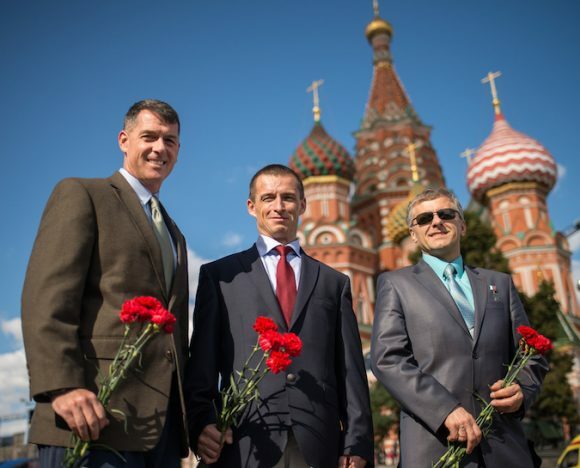 The mission crew consists of mission commander Sergey Ryzhikov, flight engineer Andrey Borisenko and NASA astronaut Shane Kimbrough. Originally scheduled to launch on Sept. 23rd, the mission would spend the next two days conducting a rendezvous operation before docking with the International Space Station on Sept. 25th. The station is currently being staffed by three crew members – MS-01 commander Anatoly Ivanishin, NASA astronaut Kate Rubins and Japanese astronaut Takuya Onish. These astronauts arrived on the station on Sept.6th, and all three were originally scheduled to return to Earth on October 30th. Meanwhile, three more astronauts – commander Oleg Novitskiy, ESA flight engineer Thomas Pesquet and NASA astronaut Peggy Whitson – were supposed to replace them as part of mission MS-03, which was scheduled to launch on Nov. 15th. But thanks to the technical issue that grounded the MS-02 flight, this schedule appeared to be in question. Then, on Monday, Sept.19th, another source cited by RIA Novosti said that the State Commission responsible for the approval of a new launch date would be reaching a decision no sooner than Tuesday, Sept. 20th. And as of Tuesday morning, a new launch date appears to have been set. According to news agency, Roscomos notified NASA this morning that the mission will launch on Nov.1st. Sputnik International confirmed this story, claiming that the source was none other than Alexander Koptev – a NASA representative with the Russian Mission Control Center. “The Russian side has informed the NASA central office of the preliminary plans to launch the manned Soyuz MS-02 on November 1,” he said. It still not clear where the technical malfunction took place. Since this past Saturday, Russian engineers have been trying to ascertain if the short circuit occurred in the descent module or the instrument module. However, the Russians are already prepared to substitute the Soyuz spacecraft for the next launch, so there will be plenty of time to locate the source of the problem. The Soyuz MS is the latest in a long line of revisions to the venerable Soyuz spacecraft, which has been in service with the Russians since the 1960s. It is perhaps the last revision as well, as Roscosmos plans to develop new crewed spacecraft in the coming decades. The MS is an evolution of the Soyuz TMA-M spacecraft, another modernized version of the old spacecraft. Compared to its predecessor, the MS model’s comes with updated communications and navigation subsystems, but also boasts some thruster replacements. The first launch of the new spacecraft – Soyuz MS-01 – took place on July 7th, 2016, aboard a Soyuz-FG launch vehicle, which is itself an improvement on the traditional R-7 rockets. Like the MS-02 mission, MS-01 spent two days undergoing a checkout phase in space before rendezvousing with the ISS. As such, it is understandable why the Russians would like to get this mission underway and ensure that the latest iteration of the Soyuz MS performs well in space. Until such time as the Russians have a new crewed module to deliver astronauts to the ISS, all foreseeable missions will come down to craft like this one.